Split pea soup can be made in a single pot by sauteing seasoned onions and garlic in olive oil then adding carrots, potatoes, split peas and stock to simmer. The soup is easy to make and only requires a frequent stir to keep from burning. Split pea soup makes an excellent warming appetizer and pairs well with rich red wines such as Merlot. This recipe serves five to six people. Ready In: 1 hr 40 min. Saute the onions and garlic in a large cooking pot with the olive oil, oregano, salt and pepper. Cook for no more than 15 minutes. When the onions are translucent, add the diced carrots and potatoes, half of the split peas and the 8 cups of stock or water. Bring to the boil then lower the heat to simmer for 40 minutes, skimming off the surface foam as it builds up. Add the other half of the split peas and simmer for a further 40 minutes, stirring regularly. When the peas are all soft, the soup is cooked. What Are Some Simple Cabbage Soup Recipes? 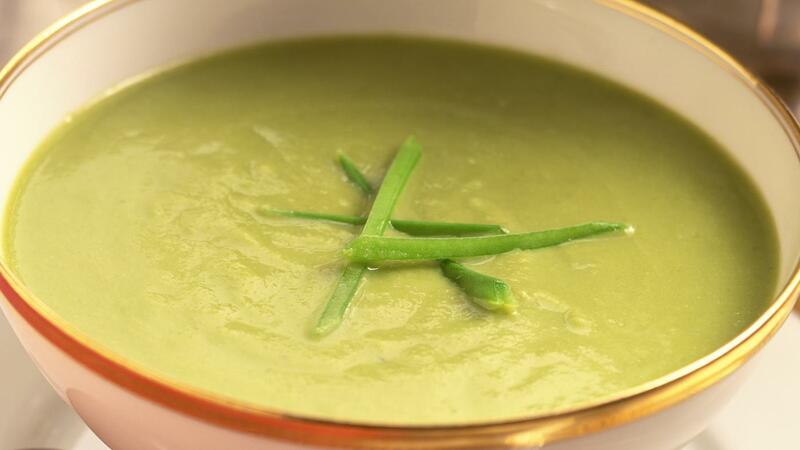 What Is a Recipe for Pea and Ham Soup Using a Slow Cooker? What Is a Good Corn Chowder Recipe? What Ingredients Are in the Healthiest Vegetable Soup Recipes?